Advantages: Convenient layout, nearly 170 illustrations with most having 3-view general arrangement drawings, excellent quick reference guide. 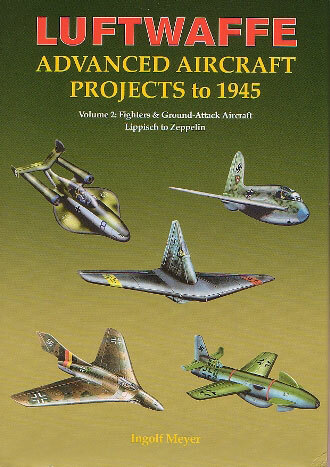 Over the years, a lot of information has come to light regarding the advanced aircraft projects of the Third Reich. Midland Publishing has taken advantage of this by printing a series of books that deal specifically with this subject. The present volume continues the alphabetical story from its earlier stable mate by covering the fighter and ground attack aircraft from Lippisch to Zeppelin. Naturally the format has been kept the same, and this is in the form of a “picture book”. The idea is to provide the reader with a quick reference guide. Here the student can look up a manufacturer’s design and instantly get a visual representation of what that proposal looked like. This is done by the author providing a general arrangement drawing as well as colour artwork of each subject in question. Of the former, there are approximately 175 of these 3-view representations. Obviously there are no detailed factory drawings available but those provided give a good idea as to the aircraft’s outline. An almost equal number of paintings are presented to showcase the subject in flight. These illustrations give the reader a more recognizable image of the aircraft and also allow the author to have some fun with the camouflage and markings. In keeping with the intention of the book, the text is kept to a minimum and where possible, technical specifications are quoted. 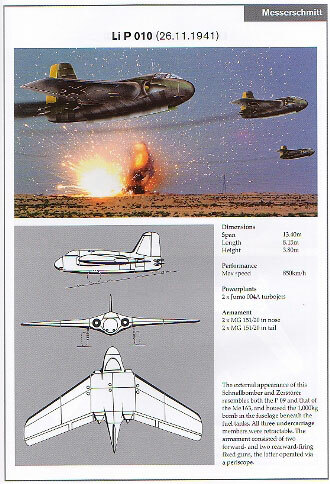 These include dimensions, weights, expected performance and armament. Most subjects are confined to a single page and a comparison between the various types is easy. The purpose of the book is to compliment other more technical texts on the subject and here it succeeds admirably. The uncluttered way in which the information is presented allows for quick and easy comparisons between the different subjects. At over 175 pages, this A4 sized hardback will keep the “Luftwaffe ‘46” fan happy for many an hour.